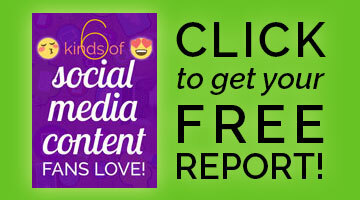 Want to create viral Facebook videos? Guest blogger Moss Clement put together these 7 tips to guide you. How to post your video to Facebook. How to get Facebook users to watch. How to get your video found. How to get Facebook viewers to act. Which shape video works best on Facebook. The basic trick of going viral. Videos have become the norm for marketers in today’s digital marketing space. But the problem many are dealing with is how to create viral Facebook videos. According to AdWeek, Facebook has proven to be the giant of social media with 22% of the world’s population having a presence on the platform. Thus, it is likely you already have a presence on Facebook as well. And as a social media marketer on Facebook, creating and sharing content on the platform is the way to go, as it helps you attract and retain your target market and prospective customers. Hence, as you may already know, video content is performing amazingly well than text content, which is why more marketers are investing in video. A recent survey by TechCrunch shows that more than 100 million hours of videos are watched on Facebook daily, and the numbers are not slowing down. In fact, a recent research by HubSpot reveals that emails that have the word “video” on the subject line increase click-through-rate (CTR) by 65%, and email open rates by 19%. However, although you are active on Facebook – regularly sharing content with your buyer persona, the odds are, you have not been able to find out how your competitors are gaining much traction with video content on Facebook. Interestingly, Facebook recently added a dedicated video tag, stressing the need for marketers to create more video content because it generates more engagement and leads than other content types. This is good for your digital marketing business – blogging, content marketing, social media marketing, email marketing, etc. What is more interesting is that, nowadays, creating a video is as easy as saying a, b, c.You can easily create a terrific Facebook video that goes viral with only your smartphone. There are remarkable examples of social media marketers whose Facebook videos have gone viral. For example, Karen Cheng’s video for the book, “Good Night Stories for Rebel Girls” which was posted in March 2017, has reach a whooping 30 million views, 134k likes, and over 519k shares. That video has reached 37 million views, 125k likes, and 299k shares. These two marketers have something in common – they know how to make video content go viral on Facebook. 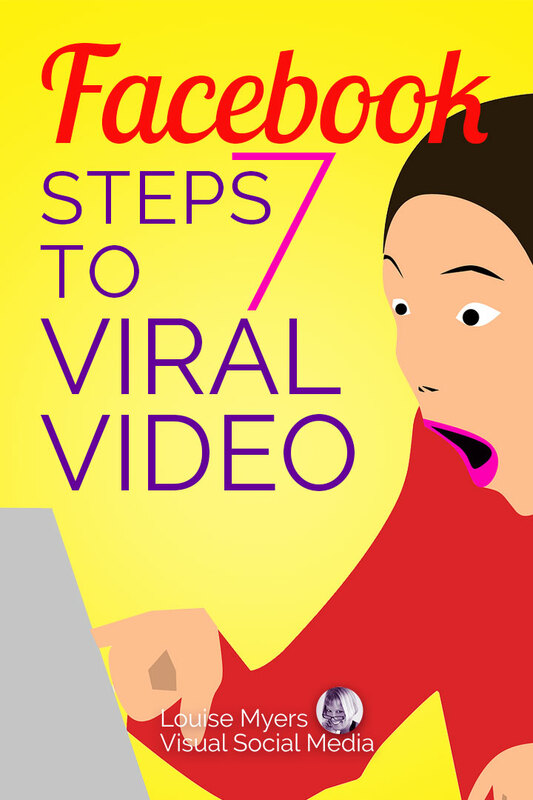 How can you create Facebook videos that go viral? In this article, you are going to learn the best, most effective, yet simple tips to create viral Facebook videos. In every marketing channel including Facebook, the first step to your success is to observe the platform to pinpoint what is working, how your competitors are getting traction and replicate it. In this regard, Ben and Cheng offer great advice for Facebook users. They suggest finding the best performing video content, study it carefully and create something similar. For instance, Cheng advice Facebook video marketers to keep observing what other marketers are doing on the platform that makes their video content go viral. In her example, she pointed out that “landscape-oriented” videos were the best performing content on Facebook, but marketers later found out that square-size videos take up 78% more space on mobile devices. This is ideal as most users of the platform are always on their mobile devices. In fact, a study by Venture Beat reveals that Facebook mobile users have surpassed one billion daily users, which points out that over 92% of users access Facebook through mobile devices. Therefore, based on what your target market wants, and also taking into consideration the priorities of Facebook, you have to continue observing the platform to figure out what is working at any given time. Make sure that you keep up with what is working on the platform and create your own version of it. Research proves that sharing a native facebook video or uploading videos directly on Facebook performs better than any other link video posted on Facebook, including YouTube links. 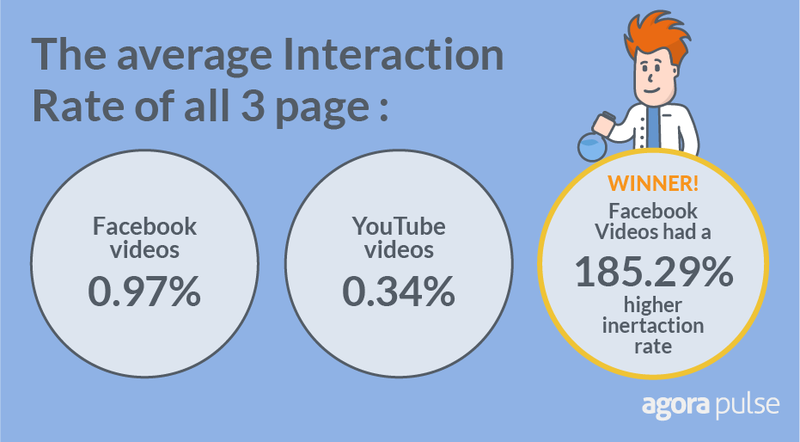 According to AgoraPulse, a test conducted on two videos posted on Facebook revealed some amazing stats. One was a Facebook native video – meaning that it was uploaded directly to Facebook. And the other video was a YouTube link that was posted on Facebook. What was the result of the experiment? Shares: The Facebook native video performed better with 50 shares, while the YouTube video link got only 4 shares. Reach: The Facebook video that was uploaded directly reached over 19,000 Facebook users, while the YouTube link only managed to reached just over 3,000 people. Comments: On comments, the Facebook native video accumulated 47 comments, compared to just 2 comments for the YouTube link video. Likes: For likes, the native Facebook video received 185 likes, as against 26 likes for the YouTube video link. As you can see, you need no further prove to show the enormous power of a Facebook native video, because the ratio here is a 1~6 and 1~10 for engagement and reach respectively. Please do not just copy a YouTube video link and paste it directly on Facebook. Links are not sharable which makes it less engaging. I recently published a blog post on “how to make your content more engaging.” It is actually a guest post on which I collaborated with the guest contributor. In section two of the post, we talked about the need to hook users right from the intro by crafting irresistible introduction for your content. In a similar way, the first seconds of the video need to grab users and make them stick. If you cannot grab their attention within the first few seconds of the video, they’ll bounce. People are always on the move – busy with many stuff and have no time to spare. So, make sure to create an eye-catching video that will grab your target market’s attention in a second or two. Although Facebook is not Google, the good news is that it encourages users to write a descriptive title for your video to make it searchable. The giant platform is attracting an average of 8 billion video views each day, according to TechCrunch. If you optimize your video with a descriptive title, this will boost your Facebook video’s visibility! When writing the title, use relevant keywords and keyword-phrases in the description. You can easily add your title when your video is uploaded on Facebook. Use the descriptive title section to craft outstanding copy with a blend of keywords. The character limit allows you to include plenty of copy to make your target audience click and watch your video. Calls to action is a phenomenal way to boost clicks and conversion in any business strategy as it moves your target market to take action. A recent study by AdRoll revealed that a call-to-action on your Facebook page can dramatically improve clicks by more than 280%. 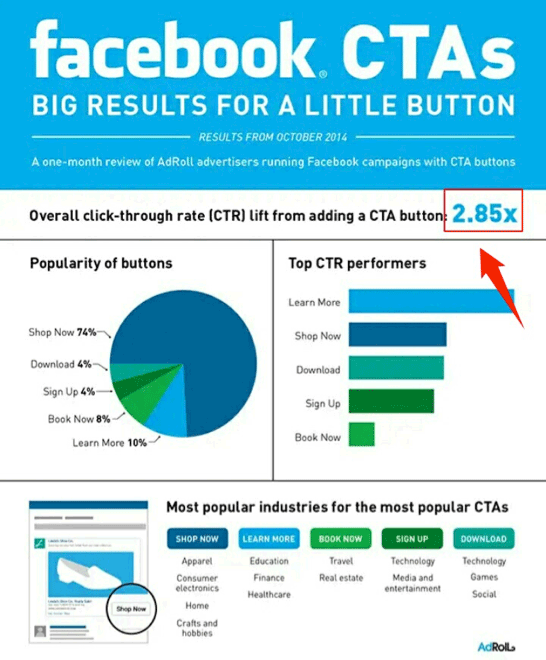 Unbounce also pointed out that more than 90% of users who read your headline read your call to action copy as well. Apply the same strategy to your Facebook video. If you’re talking in the video, mention a call-to-action – tell viewers what you want them to do. Also at the end of the video, mention a call-to-action, or have a text overlay or a static page with a call to action. A simple call to action can make your video go viral in minutes. As mentioned earlier in section one, landscape videos are no longer getting much traction, instead square videos are trending with amazing engagement on the platform. This is so because square-size videos look more appealing on mobile devices and take up over 70% space in news feed on mobile devices than landscape videos. More is the fact that, recent analysis points out that over 90% of Facebook users access the platform via mobile devices. Further research indicates that since 2013, mobile video consumption has skyrocket to over 230%, making square format video a fascinating way to create a viral Facebook video, or make your video go viral on Facebook. Why do you need influencers in your industry to share your Facebook video? Because they are experts in your niche who have built trust with their audience. They already have the followers – target market you’re looking for who trust them like the back of your hand. As a result, they influence their audience’ buying behavior. For example, if social media influencers like Rebekah Radice, Larry Kim of MobileMonkey and Word Stream, Neal Shaffer of Maximize Social Business, Louise Myers of LouiseM, Jon Morrow of Smart Blogger, Jeff Bullas, John Rampton of Due, Mari Smith, Andy Crestodina of Orbit Media, etc, shares your video with their audience, what do you think would happen? The result will be incredibly amazing because these powerful men and women are credible with remarkable track records and a loyal buyer persona. 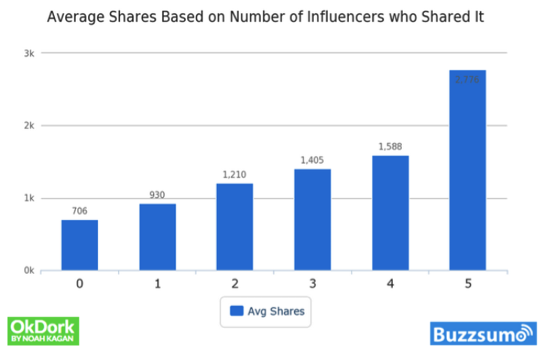 For instance, here is the result of an analysis by BuzzSumo on the average share of a content based on the number of influencers who shared the content. They found out that one influencer who shared your content resulted in over 30% more social media shares. Hence, if five influencers share the same content, the number of social media shares will quadruple. This research is actually based on written content, but the same concept is applicable to video content. However, it is not easy to convince an influencer to share your video. Yet, people like to share content that features them or in some way involves them. So look for different ways to collaborate with influencers in your video. An interview can do the trick, then, reach out and ask them to share it with their audience. The best and easiest way to do this is to use BuzzSumo to observe top performing Facebook videos. Identify influencers who shared the videos, connect with them and build relationships. Building relationships with influencers will set you up for the long run. Then create your own version of the video and reach out to them to share your video. Making your Facebook videos go viral is the dream of every video content marketer. Almost every business — from B2C to B2B marketers — is using video content marketing in their marketing campaigns to drive traffic and generate leads. These marketers have mastered the game of viral Facebook video. But to make your dream of creating viral video become a reality is a problem many marketers are dealing with. To help you make a viral video on Facebook, apply the steps in this article and test your strategies to find out what works best for you. 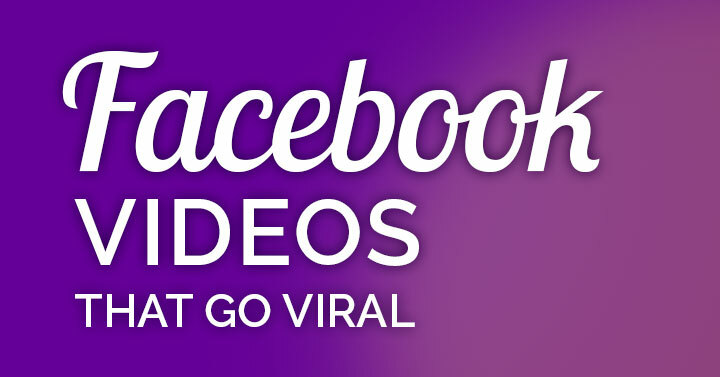 Let us know in the comment section the tips you’re using to create viral Facebook videos! This is such an informative article, Clement! I absolutely agree that videos have become a powerful tool in the social media marketing space. This makes it even more important to create appealing and powerful videos. A viral-worthy video can work wonders to spread the word about a brand and significantly increase visibility.